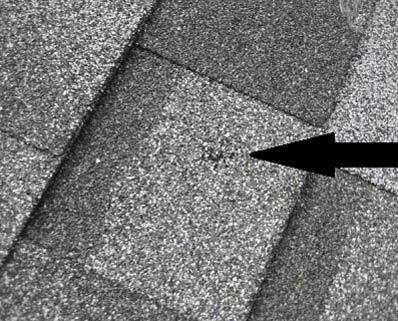 Hail damage to vinyl or aluminum siding is pretty obvious. You will see tears in your vinyl siding like the one to the left if you have hail damage. With aluminum siding, you may see tears like the one to the left or you will see noticeable dents. 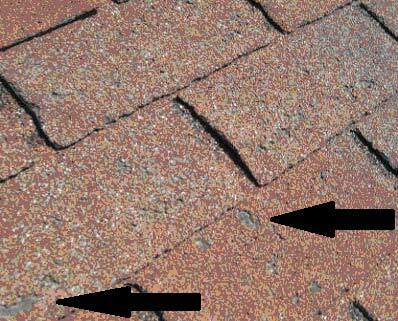 Damage to roofing, asphalt shingles, in particular, can be harder to figure out. Depending on the age, and condition of your roof, the damage may not be able to be seen from the ground. You will have to get up on your roof to check it out. Both of these next two examples were hit by a May hail storm in Northeast Indiana, and each roof was turned in and covered by insurance for full replacement. This is a 30-year dimensional shingle which was installed in the last 5 years. 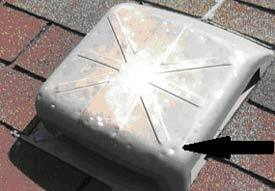 This is a 25-year, 3-tab shingled roof that was installed more than 12 years ago. 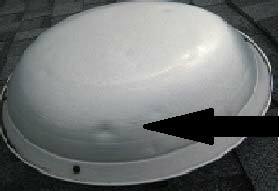 If you think you may have damage to your roof, and you are able to get on the roof, another place to look is on metal vent covers. You will notice the dents on both examples below. Still not sure if you have hail damage? If you aren’t sure, or if you cannot access your roof, please give us a call for a free damage assessment of your roof and estimate for repairs if necessary. We can also do replacement roofs and remove roof streaks.